Here’s a link to a podcast of a conversation between Anil Menon and myself that was recorded by the indefatigable Karen Burnham of Locus Online at Readercon this July. 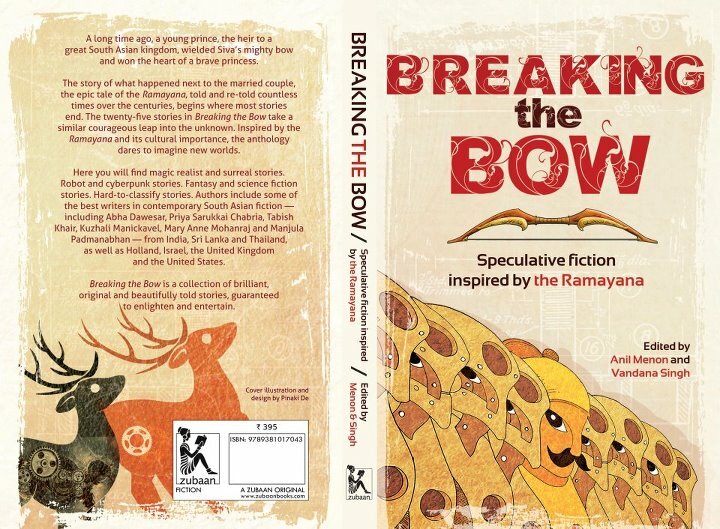 While I always cringe at hearing a recording of myself, we did have a really interesting chat about our upcoming anthology, Breaking The Bow: Speculative Fiction Inspired by the Ramayana, and about science fiction coming out of India. I first heard the Ramayana when I was very little. From time immemorial, the epic has been carried down through the generations as an oral tradition. I heard it from my mother and my paternal grandmother; the Amar Chitra Katha comic books came much later. My grandmother was particularly fond of the Bal Kand in the Ramcharitmanas of Tulsidas, which describes in beautiful verse the childhood antics of the young hero, Ram, and to this day I can sing or recite parts of it. It was my grandfather — a man of great intelligence, sensitivity and integrity, who first gave me a hint that there were multiple Ramayanas. He loved many aspects of the ancient texts, particularly the Upanishads, and was the first person to inculcate in me an appreciation of the sounds of poems in Sanskrit, especially the Geet Govind. Yet he did not hesitate to criticize when he had good reason to do so. (One of the great freedoms of Hinduism is surely the lack of a Big-Brother-style religious police to prevent you from having your say). I remember him raging about some sections of the Manu-smriti, or pointing out an absurdity in the Vishnu Purana. Once he told me that there were many versions of the Ramayana, and that some versions contained interpolations that were clearly anachronistic, containing references that belonged to times later than that of the original story. I didn’t think much about it then, being in my pre-teen years and distracted by cricket and climbing trees, but I remembered this later when I came across references to Ramayanas from the point of view of the villain, Ravana, and from Sita’s vantage point as well. Now I think of the Ramayana as a kind of palimpsest, a tapestry in multiple layers, a creation of many voices through the ages, an entity always in the making, and thus always alive. This comes out from the wonderful Zubaan Books in New Delhi, any day now. Also of interest, Locus Online’s Roundtable on SF in translation includes short pieces by Anil and me as well as many other fascinating contributions. This entry was posted on July 29, 2012 at 4:56 pm and is filed under Books, Writing. You can follow any responses to this entry through the RSS 2.0 feed. You can leave a response, or trackback from your own site. I’m eager for the arrival of the collection. Your publisher said it was coming soon. Yay! Let me know what you think once you have it and have read it.